Smith, Digby. 1813 Leipzig: Napoleon and the Battle of the Nations London: Greenhill Books, 2001. ISBN# 1853674354. 352 pages, 16 pages of photographs, 6 maps and appendices. Hardcover. Napoleonic enthusiasts who are limited to English language sources are being regularly treated to works containing translations of French and German primary source or better quality secondary source material. 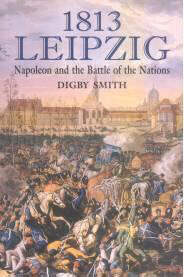 Greenhill Books have added to this burgeoning resource by publishing Digby Smith's latest Napoleonic work. 1813 Leipzig covers the great battles fought around Leipzig from 14th to 19th October 1813. It is an enormous task to comprehensively describe a battle fought over five days by nearly 600,000 men in a single relatively slim volume. It is doubly difficult to present an account that insists on switching from a detailed grand tactical macro level to a tactical micro level and back again on the same page without losing focus. This reviewer's opinion is that the author has succeeded on both counts. The author's key technique is to present the reader with a rolling grand tactical account very liberally interspersed with eyewitness accounts from all sides (the differing political objectives of the participating nations meant that the battle was fought by more than two sides). Of the 81 quoted sources, 15 are French, 8 are English, and 58 are German. Whilst I recognised all the French and English works, and Friederich, Odeleben, Plotho and Quistorp are familiar names via footnoted sources in works by Maude, Nafziger and Petre, there still remain a great number of German language sources that this book exposes to this reviewer for the first time. Is there any bias in the reporting? There is certainly no frenzied assault on the qualities of any particular character. However, when the author departs from plain narrative and eyewitness accounts and provides commentary on the performance or behaviour of individuals there is a coolness attached to his description of Napoleon's that leaves the reader in no doubt where the author's sympathies lie. The appendices contain mainly order of battle information. The information is of a very high standard, and the author pays particular tribute to the researches of George Nafziger regarding the French data. Overall, a detailed and flowing narrative account providing another success for Digby Smith and Greenhill Books. Definitely recommended.